This product qualifies for a free gift with purchase. Add this product to your cart to claim your free gift. Hurry! Free Gift is only available for a short time! The Goodman GMSS920803BN furnace is a single stage furnace that features a heavy duty aluminized-steel tubular heat exchanger and a stainless steel secondary heat exchanger with a durable silicon nitride ignitor. These furnaces are run-tested for heating or combination heating/cooling applications. With its corrosion-resistant and painted steel cabinet, this furnace can be installed in a utility room, closet, alcove, basement or attic. The Goodman GSZ140241 Heat Pump uses the chlorine-free refrigerant R-410A to help prevent damage to the Ozone Layer. This unit is equipped with sound-dampening features to provide operating sound levels are among the lowest in the heating and cooling industry. Using high-quality components, the Goodman GSZ140241 heat pump is rated at 14 SEER and will help reduce energy consumption throughout the life of the system. The Goodman CHPF3636B6 Horizontal Cased Indoor Air Conditioner Evaporator Coil is made for use with split-system air conditioning and Evaporator systems. 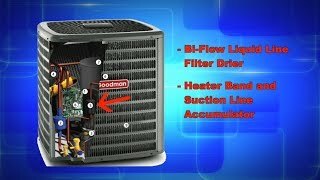 The Goodman Air Conditioning and Heating Company has become one of the largest manufacturers of residential and light commercial air conditioning, heating, and indoor air quality products and systems by focusing on just one thing, building the most reliable and refreshingly affordable indoor comfort products in the market. The GSZ140241 2 Ton Goodman Heat Pump uses the chlorine-free refrigerant R-410A to help prevent damage to the Ozone Layer. This unit is equipped with sound-dampening features to provide operating sound levels are among the lowest in the heating and cooling industry. Using high-quality components, the Goodman GSZ140241 heat pump 2 Condenser is rated at 14 SEER and will help reduce energy consumption throughout the life of the system. Goodman furnace - The Goodman GMSS920803BN furnace is a single stage furnace that features a heavy duty aluminized-steel tubular heat exchanger and a stainless steel secondary heat exchanger with a durable silicon nitride ignitor. These furnaces are run-tested for heating or combination heating/cooling applications. With its corrosion-resistant and painted steel cabinet, this furnace can be installed in a utility room, closet, alcove, basement or attic. Not intended for use in mobile homes. The Goodman GMSS920803BN furnace has a 92% AFUE rating which means that for every every $1.00 you spend, 92 cents goes towards heating your home. Outstanding company to work with. Had an issue that was now fault of their own but one phone call and it was handled!! Thank you HVAC Direct!! I have owned my house for over 20 yrs. When it was built it came with a Goodman heat pump. It just died, very impressed. Now I will buy another Goodman, hope for the same quality and years of service. Bought this furnace read some reviews seems great got it and installed it with 0 HVAC experience super easy and runs great it’s very quiet to! Unit came undamaged. Installation was easy. Unit started up with no problems. It has now operated for one winter trouble free.